Utah Valley University is a teaching institution which provides opportunity, promotes student success, and meets regional educational needs. UVU builds on a foundation of substantive scholarly and creative work to foster engaged learning. The university prepares professionally competent people of integrity who, as life-long learners and leaders, serve as stewards of a globally interdependent community. Student Success: UVU supports students in achieving their educational, professional, and personal goals. Objective 1: UVU supports students’ preparation for and achievement of academic success at the University. Objective 2: UVU provides a meaningful and well-rounded university experience. Objective 3: UVU prepares students for success in their subsequent academic, professional, and lifelong learning pursuits including serving as leaders, people of integrity, and stewards of their communities. 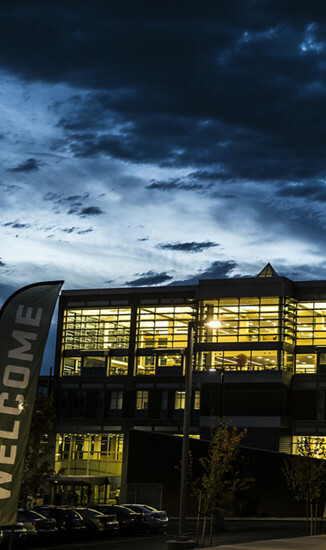 Serious: UVU fosters a culture of academic rigor and professional excellence. Objective 1: UVU champions learning through outstanding teaching in an academically rigorous environment. Objective 2: UVU supports a culture of scholarship and creative work and promotes accomplishment in cultural, academic, and co-curricular/extramural endeavors. Objective 3: UVU attracts, develops, and retains high achieving students and highly qualified faculty, staff, and administrators. Objective 4: UVU is recognized for high-quality, efficient and effective programs and services. Engaged: UVU engages its communities in mutually beneficial collaboration and emphasizes engaged learning. Objective 1: UVU faculty and staff engage students using real-world contexts within the curriculum and activities outside the classroom to increase professional competence and confidence. Objective 2: UVU fosters partnerships and outreach opportunities that enhance the regional, national, and global communities. Objective 3: UVU serves as a portal of civic engagement and an engine of regional economic and business development. Inclusive: UVU provides opportunity for individuals from a wide variety of backgrounds and perspectives and meets regional educational needs. Objective 1: UVU provides accessible and equitable educational opportunities and resources for all students. Objective 2: UVU provides opportunities to improve intercultural competence in an increasingly complex, diverse, and globalized society. Objective 3: UVU provides an inviting, safe, and supportive environment for people from diverse backgrounds and perspectives. Objective 4: UVU offers an array of courses, programs, and delivery methods designed to reflect students' goals and the region's educational needs. Integrative and Applied Learning: A student will engage in discipline-appropriate experiences with the academic and broader community through integrated and applied learning. Intellectual and Practical Skills Foundation: A student will acquire a foundation of intellectual and practical skills including communication, quantitative reasoning, qualitative reasoning (critical, analytical, and creative thinking), and technical and information literacies. People of Integrity: A student will become personally and socially responsible by acquiring, developing and demonstrating skills in ethical reasoning and understanding. Professional Competency: A student will demonstrate professional competence by meeting the established standards of the discipline, working as a valued member of a team, effectively formulating and solving problems, and actively seeking and honing lifelong learning skills. Stewards of Place: A student will demonstrate stewardship of local , national, and global communities by cultivating awareness of: interdependence among those communities; issues within those communities; and organizations and skills that address such issues. Knowledge Foundation: A student will demonstrate knowledge of human cultures and the physical and natural world in the following areas of essential study: arts, history, humanities, languages, science and mathematics, social sciences. Knowledge Foundation refers to GE Distribution courses and other courses and experiences within the major. Provides quality academic learning opportunities for students through programs at the certificate, associate, baccalaureate, and graduate levels. To encourage responsible citizenship, emphasis is placed on engaged teaching and learning as well as scholarly work, research, creative achievements, career and technical education and community and professional engagement. Provides access to higher education and offers a broad range of opportunities from developmental education through honors programs. The institution provides services designed to meet the educational and personal needs of students, to foster student success, to prepare students for meaningful lifework, and to provide access through a variety of modalities, including satellite campuses and the use of technology. Promotes economic and cultural development to contribute to the quality of life of the region and state. The institution fosters economic development and provides a talent-force to meet the needs of a dynamic economy by offering credit and non-credit programs and services for individuals and organizations. UVU provides cultural experiences that enrich the community and offer significant and varied opportunities for continuous learning. Utah Valley University was established as Central Utah Vocational School in September 1941 with the primary function of providing war production training. Post-war training needs found the school offering programs throughout the region and at the Utah County Fairgrounds. The three school districts within Utah County combined efforts to purchase a thirteen-acre site close to Provo High School. In 1963, the name was changed to Utah Trade Technical Institute to emphasize its growing role in technical training. The name change to Utah Technical College at Provo in 1967 was accompanied by the authority to award the Associate in Applied Science Degree. The Associate in Science Degree was added in 1972. The initial 185-acre Orem Campus was dedicated in 1977. In 1987, the name was changed to Utah Valley Community College and the Associate in Arts degree was added by the Utah State Board of Regents. In 1993, the name was changed to Utah Valley State College reflecting the change in mission to offer high demand baccalaureate degrees. The Utah State Legislature approved, in February 2007, a name change to Utah Valley University that became effective July 1, 2008. The Utah State Board of Regents approved the corresponding mission change in December 2007 to give authority to offer master level degrees; this also became effective July 1, 2008. Utah Valley University is accredited by the Northwest Commission on Colleges and Universities. The Northwest Commission on Colleges and Universities (NWCCU) is an independent, non-profit membership organization recognized by the U.S. Department of Education as the regional authority on educational quality and institutional effectiveness of higher education institutions in the seven-state Northwest region of Alaska, Idaho, Montana, Nevada, Oregon, Utah, and Washington. In addition, some programs or majors have other specialized accreditation. Gainful Employment information is provided in compliance with the U.S. Department of Education’s disclosure requirements for programs eligible for Title IV financial aid that prepare students for gainful employment in a recognized occupation as required in 34 CFR 668.6(b). All programs list the following information: CIP Code, Level of Program, Program Length, Tuition and required fees, Estimated costs for books and supplies, Debt at program completion, Program completion in Normal Time, Job Placement, and Related Occupations. Gainful Employment Program Disclosure is listed on all marketing materials for potential students.